A while back, I mentioned that I was hungry for a meaty epic fantasy. I got what I asked for in a novel with an usual premise: it is set in a modern-day earth based on the writings of Dante, Shakespeare’s play, The Tempest, Dante’s Inferno, Gnostic writings, various legends and fairy tales–and even children’s stories. I received this book in August, courtesy of Tor. They actually sent me the second book in the series, Prospero in Hell, but I had not read the first. So I wrote to the publicist who sent it to me and requested the first book in ePub format. therefore, I read Prospero Lost on my Nook. Miranda is the Miranda of The Tempest. I meant to reread The Tempest before writing this review, but I’ve been swamped and so I decided to go ahead and write it. As the author mentions in an interview or FAQ that I read somewhere, she gives a recap of the whole play in the early chapters, anyway. The novel begins with a premise that is absolutely fascinating. Miranda finds this secret message left by her father, which could only be read by the light of a phoenix lamp. Woah, I said to myself. A phoenix lamp? I’m hooked! Her father instructs her to locate her brothers and sisters–six, in all, but only five are still alive–and warn them that “the three shadowed ones” are after their magical staffs. So yes, I was completely intrigued. But then, as I mentioned above, the book dives into lots of backstory. One of Miranda’s airy spirit servants is named Mab, and he’s in the guise of a 1940-s dime novel detective. Armed with his notebook and stubby pencil, he begins to question her. Not only are we given the story of The Tempest, but I discover that Miranda is the handmaiden of a divine being called Eurynome, whose symbol is a unicorn, and as such Miranda has been a virgin for her entire life–some 500 years. It took me over a month to read the opening chapters. As I mentioned in earlier posts, I needed Miranda to save a cat or something, because she seemed cold and unlikable. I read Susanna Ive’s Rakes and Radishes and Julie Moffett’s No One Lives Twice, and finally I picked this up again. Miranda decides to go after her brother Mephistopheles, first. Last she knew, he was in Chicago. After a few false leads, a prayer to Eurynome leads her to her brother. And at this point, she at last has her save the cat moment as she rescues him out of the gutter. Mephistopheles is now considered to be “mad”, but he also claims to know where all the rest of the brothers and sisters are. Next they go after Theo, and when I met Theo, I finally became emotionally invested in the story, stopped setting it aside, and started really liking it. If only I could have had more of him! The rest of the story consists of Miranda making contact with several of her siblings and trying to convince them to help. She’s also telling backstory to Mab, who like a good detective, is trying to come up with a motive that will lead him to the perps. There are a lot of twists and turns. If you read this story, pay attention to the episodes of backstory, which are usually conversations between Mab, Mephisto and Miranda. They are actually rather intriguing little side stories, and it seems like every detail is vital. Father Christmas makes an unexpected appearance in the story, and even he turns out to be quite important. There are elves, too–one of whom Mephisto was trying to get to marry Miranda. However, not only is Miranda sworn to remain a virgin, but she’s still hung up on the guy she met in The Tempest–Ferdinand–who she never actually married, and he makes an unexpected–although at this point, I should have expected it!–appearance as well. I do have some nitpicks. There are entirely too many explanation points and dialog tags, especially when Mephisto is talking. Mephisto doesn’t come across as “mad” at all, merely eccentric–and no more eccentric than Miranda, herself. And Ms. Lamplighter did not handle her chapter endings well–she would build up to a cliffhanger or some emotional point, have a chapter break, and then resume the story after the point that the cliffhanger built up to. Therefore, we never got to experience the point of the cliffhanger, or we experienced it only as a recollection. Also, at first the book seems hostile to Christianity in general and Catholicism in particular, but this turns around the deeper you read, with one character saying that the family “never should have converted from Catholicism”. In fact, the story depends on the belief in many Christian concepts, albeit from a Renaissance worldview. I initially assumed that Eurynome was a goddess, but it turns out she was not–but what she is is nothing you would expect. When Prospero enslaved the winds, it seems that he also enslaved the spirits that control electrical power, and it is only due to Prospero’s binding of these spirits that the world can use electricity at all. He keeps them bound to make electricity behave as it does. However, this does not seem logical. Unless Prospero possessed the secrets of the universe when he enslaved the spirits, he would not know how to make the spirits behave when we reached the point where we harnessed electricity. So in this case, my suspension of disbelief is pushed to the point where I am forcing myself to buy into this premise. By the end of the story, I loved Miranda and her brothers and sister, even Mephisto, who is rather annoying at first. I am ready to jump into the second story, Prospero in Hell, which has an intriguing image of a sword-wielding Miranda on the cover, and promises to introduce the rest of the Prospero children and reveal many secrets. 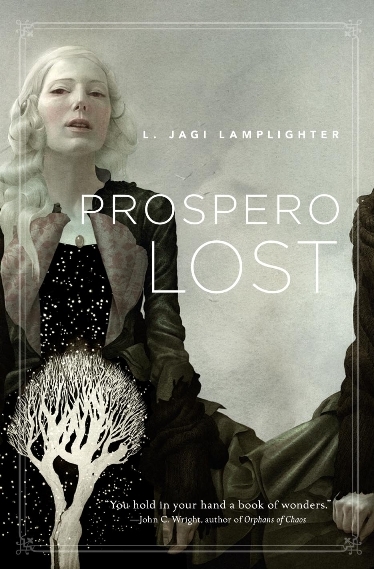 Prospero Lost is highly imaginative and packed with wonder. I am giving it three stars, however, I am placing it on my Keeper shelf. I recommend it if you have the patience to stick with a character who is compelling without being likable, and if a modern-day fantasy based on Renaissance Christian beliefs would appeal to you. No, you are right. Ariel is in there, but as a different character–the butler. He still speaks the way he did in The Tempest, too! I really enjoyed this one and actually liked Mephisto best so I was able to get invested in the story fairly soon. Prospero in Hell is excellent too – I can’t wait to read the final one, Prospero Regained, but the release date is several months away. I have PROSPERO IN HELL right next to me, ready to get into. Tia, I love the way you hid the spoiler!!! Do you mind if I use that technique? Kat, it was not my idea, so use that technique all you want! I think I got it from Kimber An. Now even though I gave it three stars, I did like it well enough to read the next book. I gave it three stars because I did set it aside more than once and even when it finally engage me, there were those issues I detailed above. Great review! I think I’m going to gift this one for a friend who I know would love it!